List of peace activists. In 2001 he was posthumously awarded the Grammy Lifetime Achievement Award and a feature-length documentary about his life Rebel Music won various awards at the Grammys. He was the rhythm guitarist and lead singer for the ska rocksteady and reggae bands The Wailers (1963-1974) and Bob Marley & The Wailers (1974–1981). 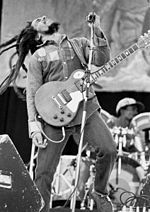 His best-known hits include "I Shot the Sheriff" "No Woman No Cry" "Could You Be Loved" "Duppy Conqueror" "Stir It Up" "Get Up Stand Up" "Jamming" "Redemption Song" "One Love" and "Three Little Birds" as well as the posthumous releases "Buffalo Soldier" and "Iron Lion Zion". Nesta Robert "Bob" Marley OM (6 February 1945 – 11 May 1981) was a Jamaican singer-songwriter and musician.